Can the tech nerds lead us? The most uplifting event of the last week wasn’t the election, which was a wash, some good, some bad. Government will be slightly less evil for it. But the strike by Google workers was thrilling. Supporting the Marriott workers? Not wanting the military to use their creations? Against sexual harassment? Pro immigration? 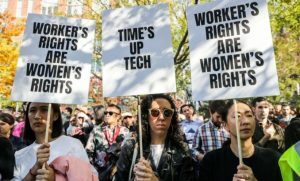 These tech workers may be the autoworkers of today, the ones whose sit-down strikes gave us the weekend and much much more. They are in a position to shut this country down. They can taste their power. You like disruptive paradigms? We got you. Things haven’t changed that much since 1936. Real power is still at the point of production. Look out Amazon, Whole Foods, Walmart, Target, Apple, Microsoft, and so on. The techies are woke: they have discovered that all the money in the world doesn’t make the collapse of the planet any more pleasant. Of course it will take organization. Not just unionizing, though that for sure. Organizing to keep the unions honest, fighting for the workers rather than themselves. And for the planet. For workers everywhere. Hear, here, Henry. Go for it! You worote, “The techies have discovered that all the money in the world doesn’t make the collapse of the planet any more pleasant.” I think, though not sure, that Pixar walked out the same day as Google in solidarity. These actions work on the future because they strengthen the attitudes of those who participate. Keep that point of production moving. My blog today was about woodcarving, called Birds and Knives, brought on by the Google Doodle. It gets to the disruptive paradigm the old, slow way.